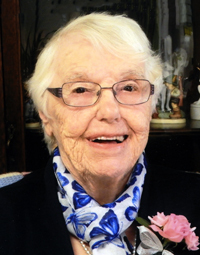 Peacefully at the Notre Dame Foyer on Tuesday, February 5, 2019, Mrs. Clémence Roch of Notre Dame de Lourdes, Manitoba passed away at the age of 100 years. Clémence was predeceased by her first husband Jean Montagnon and her second husband Gabriel Roch, her daughter Sylvanne (Charles), her granddaughter Chantal Sibilleau, her parents Louis and Maria Brouzes. Funeral services will be held in the Notre Dame Roman Catholic Church on Saturday, February 9, 2019. Prayers and video tribute at 12:30 pm followed by Funeral Mass at 1 p.m. with Father Alain Guenou officiating. Interment will take place after Mass at the Notre Dame Parish Cemetery. A heartfelt thanks to the wonderful staff of the Foyer Notre-Dame for their loving care over the last two years of Clémence’s life.